Since arriving at the Metropolitan Opera as general manager in 2006, Peter Gelb has been angling to make the soprano Anna Netrebko a house prima donna in the old-world sense: a first among equals. On Monday night Mr. Gelb must have felt that the plan was working. Ms. Netrebko sang the punishing title role of Donizetti’s “Anna Bolena” to open the Met’s season, the company’s first production of this breakthrough Donizetti work from 1830. 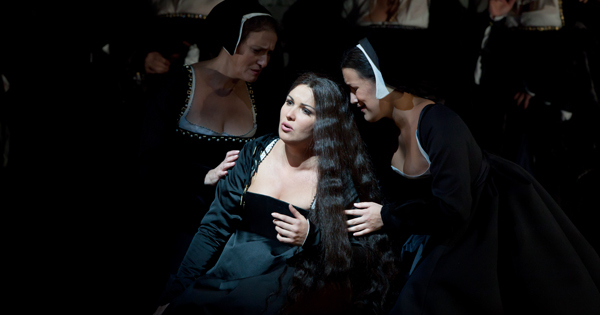 The extended last scene was the high point of Ms. Netrebko’s performance as the distraught British queen (based on the historic Anne Boleyn, the second wife of Henry VIII). Having been falsely condemned for betraying her husband, Anna drifts in and out of sanity. Ms. Netrebko sang an elegantly sad aria with lustrous warmth, aching vulnerability and floating high notes. When the audience broke into prolonged applause and bravos, Ms. Netrebko seemed to break character and smiled a couple of times, though her look could have been taken as appropriate to the dramatic moment, since the delusional Anna is lost in reverie about happy days with her former lover. Then at the end of this “Mad Scene,” when Anna, restored to horrific reality, curses the king and his new queen, Giovanna (Jane Seymour), and stalks off to her execution, Ms. Netrebko dispatched Donizetti’s cabaletta, all brilliant coloratura runs and vehement phrases, with a defiance that brought down the house. Yet Ms. Netrebko’s Anna and the overall performance of “Anna Bolena” were not what they could have been. The production, by the director David McVicar, is uninventive and safe. The sets, by Robert Jones (in his Met debut), are handsome and efficient but tamely traditional, using a matrix of rotating white brick walls and sliding wood panels to evoke the interiors and environs of Henry’s palaces. In Act I, when the king’s hunting party gathers, complete with two impressively large dogs, a bit of abstraction is introduced into the look of the production through some sculptural gray trees. Jenny Tiramani’s costumes are colorful, detailed and true to the period. Too true. This Henry could have come from the set of almost any of the innumerable films and television shows that have been made about the Tudors. But the bigger problem was Marco Armiliato’s routine conducting. Mr. Armiliato has been valuable to the Met’s Italian repertory wing since his 1998 house debut. In “Anna Bolena” he conveyed an understanding of bel canto style, in which arching lines must be given room to spin and cast their spell and accompaniment patterns have to be flexible. The singers seemed to feel supported by Mr. Armiliato, who was always there when they took expressive liberties. That was the problem. This performance needed a conductor to instill some intensity into the music, to keep the cast more on edge, especially in the early scenes. Much of the action occurs in highly charged bursts of dramatic recitative. But too often here the orchestra chords that buttress the vocal lines were listless. And the orchestra’s playing lacked character. Previously, Ms. Netrebko had sung the role of Anna only at the Vienna State Opera this spring. She started tentatively on Monday, perhaps settling in for the long, hard night of singing that awaited her. She looked regal and splendid. And in a nice directorial touch, Anna first appeared with a little red-haired girl, clearly her daughter, the future Queen Elizabeth. At 40, Ms. Netrebko may be in her vocal prime. Her sound is meltingly rich yet focused. Sustained tones have body and depth. Her contained vibrato exposed every slight slip from the center of a pitch, especially in midrange, but I’m not complaining. This remains a major voice, with resplendent colorings and built-in expressivity. Bel canto purists have long debated whether Ms. Netrebko is a natural to the style, especially in her execution of coloratura passagework. She may not have the nimble precision exemplified by Beverly Sills (who was criticized in some circles for that very accuracy). Ms. Netrebko’s approach is to sing coloratura as an expressive elaboration of the vocal line, as she did affectingly as Anna. And she exudes vocal charisma. Still, at moments throughout the evening her singing seemed cautious. She was at her best when sparring with other singers, especially the mezzo-soprano Ekaterina Gubanova, who was Giovanna (the queen’s lady-in-waiting Jane Seymour, though it’s best to stick to the Italian names, since “Anna Bolena,” with a libretto by Felice Romani, plays very loose with history). Ms. Gubanova has an ample, dark voice with a slightly hard-edged quality that takes some adjusting to. She sang Giovanna with incisive delivery, folding embellishments and runs into impassioned vocal lines. Her character was a bundle of nerves in Donizetti’s inspired Act II scene in which Giovanna finally confesses to the queen that she has been the king’s mistress and will become his new wife. Again the orchestra under Mr. Armiliato seemed to hold back, rather than empower, the intensity these two artists were trying to summon on stage. The bass Ildar Abdrazakov brought his earthy, muscular voice to the role of Enrico (Henry VIII). Though his passagework was muffled by his gravelly tones at times, he was an imposing presence, and he did not overplay the king’s brutishness. The tenor Stephen Costello won a hearty ovation for his Riccardo (Lord Richard Percy, Anna’s former lover). This was a big assignment for the gifted and game young tenor. Mr. Costello captured the character’s consuming adoration for Anna through his impetuous and anguished singing. The role includes a touchstone tenor aria, “Vivi tu,” in which the condemned Riccardo implores his friend Lord Rocheford (Anna’s brother, here the solid bass-baritone Keith Miller) to evade the king’s wrath and go on living. Mr. Costello mostly navigated the music’s demanding passagework and exposed high notes. To hear this rising artist stretching himself was part of the excitement. The mezzo-soprano Tamara Mumford took on the trouser role of Mark Smeaton, a court musician with a fatal crush on Anna. Her singing was sometimes shaky but always honest and ardent. The able tenor Eduardo Valdes as the court official Hervey rounded out the cast. Every role is significant in an opera so rich with ensembles, including a climactic Act I sextet almost as memorable as the enduring sextet from Donizetti’s “Lucia di Lammermoor,” and more contrapuntally intricate. Mr. Gelb has said that ideally the Met should make an artistic statement by presenting an ambitious new production every opening night. Two years ago he took a chance on Luc Bondy’s ill-conceived staging of Puccini’s “Tosca.” Last season came the premiere of Robert Lepage’s production of Wagner’s “Rheingold,” which is still being argued over, as audiences await the last two installments of the complete “Ring” cycle this season. “Anna Bolena” represented a different sort of risk. To make a case for this great, overlooked opera a company must have a stellar soprano in the title role. Ms. Netrebko is that artist. If only she and her colleagues on stage had received more help from Mr. McVicar and Mr. Armiliato. The gala evening performance was relayed to Times Square and to Lincoln Center Plaza, where there was seating for some 3,000 people who had scooped up free tickets earlier. After the curtain calls on stage, the “Anna Bolena” cast appeared on the Met’s outdoor balcony to the cheers of the crowd. This is becoming a welcome tradition under Mr. Gelb. “Anna Bolena” runs through Oct. 28, with additional performances in February, at the Metropolitan Opera House, Lincoln Center; (212) 362-6000, metopera.org. As ever, in the history of music, the “critics” are the ones who write and in many cases enhanced or destroyed a singer/musician’s career. This has been the constant case from the inception of musical criticism with Schumann and Berlioz in the mid-nineteenth century. This is not to say that Tommassini has any power to ruin Netrebko’s career, but he does have a huge audience by being the critic of one of the most powerful and well-read newspapers in the world. So, NOW, now he chooses to talk about Bel Canto, about Italian singing when the last year brought absolutely horrifying presentations of Puccini and Verdi? I absolutely agree with Mr. Tommassini, that Netrebko’s voice is one of the most beautiful voices cast at the Met this year, but let’s not discuss pitch or wavering from it, shall we, or we ought to have a new society for it. Forgive me but Netrebko is the LEAST off pitch and her tone is unparalleled by her colleagues singing at the Met. It seems that nothing was said about the extravagant flatness, sharpness, and completely disgusting Italian diction that was presented last season, was it? In all, her singing is always expressive and she carries some of the mystique that singers of old carried with them, that implausible something that elevates them to the level of artists. I agree that Armiliato was probably not the best choice to conduct Bolena and it is certainly too bad that Maestro Levine was not able to conduct this opening. However, Bel Canto as the opening opera is not a choice made just to appease the rowdy public after that disastrous Tosca premiere last year (truly abominable), as Tommassini writes. Bel Canto is the heart’s blood of the operatic machine that has withstood centuries. More Bel Canto should be performed so that young singers will approach it without fear and with a more familiar ear. I applaud the Met for presenting this difficult opera and to those who stretched their limits in trying to do the only thing they could in an age when those who truly understand Bel Canto are few and far between. I heard only piece of broadcast (1stAct) and was my first time hearing Netrebko. I agree voice has some very distinctive color and quality and she delivers a long expressive vocal line. The Italian diction however is poor. Did you see the review by Mike Silverman (AP). The one by Tommasini is not bad, but I liked much more the one by Silverman. I didn’t yet read that Carlos. Thanks for referring it.